I’ve often said of my thrilling decade as a Nat Geo aerial photographer leaning out of open helicopters—and now of my days as a hopelessly addicted biker—that anyone who tells you that the risk is not part-and-parcel of the thrill is not telling you the truth. To borrow a key phrase from Tim Winton’s piece, we bikers gladly barter the cold scorch of fear as the price we pay for indulging our passion. But as the years pass and uneventful miles pile up, the cold scorch grows ever more tepid—that is, until you lay your bike down (such a curious phrase) amid the stench of burnt rubber and the ugliness of twisted metal. Or you learn of someone who has “transferred to Thunder Chapter” (another euphemism, this one from the biker gang world in which I was embedded, for the finality of dying). And then the cold scorch returns to the back of your throat, just as frigid as ever. Most of the cycles on display in The Race Track exhibit barely a hint of the scars that would reflect their rough-and-tumble past as machines that were piloted to the edge of the precipice. The 1951 Triumph Bonneville Salt Flats Racer that carried 13-year-old Bobby Sirkegian to a mind-numbing speed of 122mph over six decades ago has been painstakingly restored by Sirkegian himself to its pristine pre-race condition, erasing all the salt and the corrosive effects of time. Nowhere on that steed is there any evidence of the cold scorch of fear that must have rattled around in the mind of a kid who answered the challenge of the crystallized, rutted surface of Bonneville. 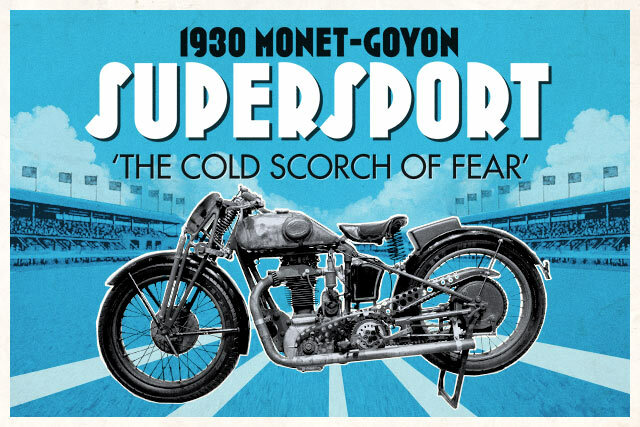 But just a few feet away rests a 1930 Monet-Goyon Supersport Model H in its unrestored racetrack condition. This French model has not been airbrushed or photoshopped to eliminate any of the time-worn scars from its bruising life on the European race circuit 90 years ago. Its fuel tank and bullet-holed chain guard are pockmarked with dents and scrapes too numerous to count, as if the artist Jackson Pollock had visited the track and attacked this cycle with his slashing style, having grown weary of attacking canvas. If you stare at the Monet-Goyon long enough, you can almost feel the scraping of human flesh along the cinder track and the contusions of the rider that mirror the contusions on the fuel tank from the occasions when that bike went down. And you instinctively know that in the moment of collision, the racer must have felt the cold scorch of fear, not knowing how severe a price this mishap would extract from his body. Even for non-racers such as myself, The Race Track is a vivid reminder that being aboard a motorcycle is not hopscotch or chess or any other form of entertainment that doesn’t “enjoy” a component of physical risk. For bikers, the cold scorch of fear may go into temporary hibernation, but it never goes away—it is always waiting patiently in the real or imagined sidecar beside you, waiting to tingle your nerve ends whenever you lay that bike down or one of those countless “close calls” interrupt your idyllic ride. Bobby Haas is a bike collector, author, Nat Geo photographer and ex-financier who is currently working hard on his latest endeavour, the Haas Moto Museum in Dallas. He owns five Hazan bikes amongst 170 others and when he’s not bidding at moto auctions, he likes to write.